Fairtrade Haworth and Fairtrade Keighley are the victors in the Fairtrade Foundation’s national campaigner awards. 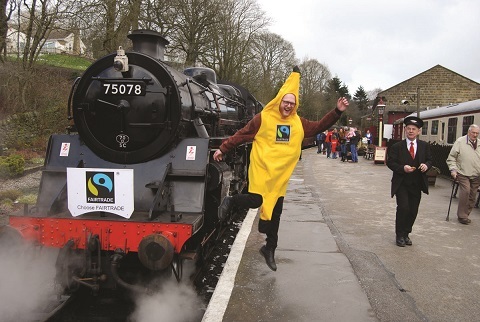 Their ‘Fair Train’ event held on the Keighley and Worth Valley Railway scooped the prize for the most creative breakfast held during Fairtrade Fortnight. Many congratulations to Rita Verity and all the organisers and helpers. For the event, the Keighley and Worth Valley Railway (the first Fairtrade steam railway in the world) served breakfast on the 11am steam train for the 10 mile round trip on Saturday 5th March. Starting in Oxenhope, where Morris dancers welcomed the Lord Mayor of Bradford, Fairtrade supporters boarded the train along with musicians who entertained the passengers. Ryan the banana joined the train in Haworth and, on arrival in Keighley, the Keighley Fairtrade group handed out roses. Most passengers were unaware that there would be a free breakfast and there was great feedback about the delicious products from many who knew little about Fairtrade. Fairtrade Haworth and Fairtrade Keighley are very grateful to the companies who donated Fairtrade goods, including: Co-op, Divine Chocolate, Liberation Nuts, M&S, Sainsbury’s and Tropical Wholefoods.